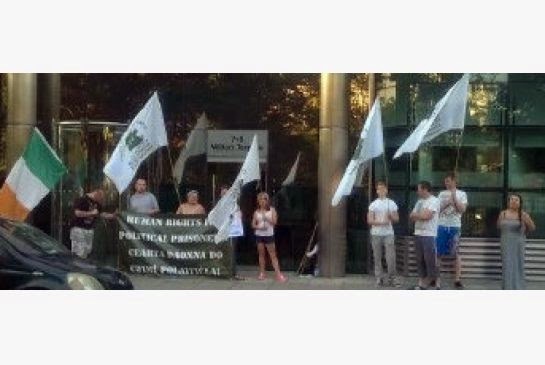 Picture Below: A protest is held Thursday outside the Canadian Embassy in Dublin, according to a spokesperson for the 32 County Sovereignty Movement. A newspaper in Northern Ireland is reporting that three members of an Irish republican group were detained and denied entry to Canada at Pearson International Airport on Wednesday. The men, said to be on a six-day speaking tour, were members of the 32 County Sovereignty Movement (32 CSM), a fringe republican organization. Their names were given as Francis Mackey, Peter Fitzsimons and Martin Rafferty. According to the Ulster Herald, “32 CSM has been linked to the Real IRA”, a splinter group from the Irish Republican Army responsible for a bombing in 1998 that killed 29 people and two unborn children. The Real IRA is listed as a foreign terrorist organization by the U.S. Department of State but is not listed as a terrorist entity on Public Safety Canada’s website. “The 32 County Sovereignty Movement are not a proscribed organization in Canada so this is clearly politically motivated and an attempt to silence and stop the 32 County Sovereignty Movement from getting its message out,” said 32 CSM on their Facebook page. The Ulster newspaper said the three men were taken from the airport to be detained in prison before deportation. 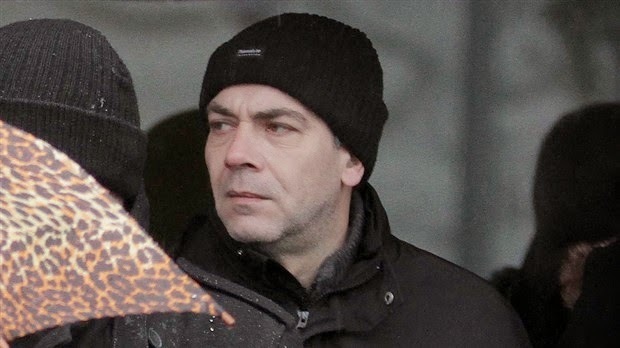 A spokesperson for 32 CSM said by email that a protest had been held outside the Canadian embassy in Dublin on Thursday and that the three men were en route back to Ireland as of Thursday evening. According to Anti-Colonialist Working Group spokesperson Julian Ichim, who said he was one of the organizers behind the speaking events, the men were supposed to speak to steelworkers in Hamilton on Thursday as well as at separate events in Toronto and in Kitchener. “From my conversation with Peter Fitzsimons it was very clear that they were being detained for their membership in the 32 county sovereignty movement,” said Ichim who said he was able to communicate with Fitzsimons via Facebook when he was at the airport. “They were specifically told that they were denied entry in the country because in the United States they’re a proscribed organization,” said Ichim. Ichim also said the men were supposed to meet other groups including an organization called the Hugo Chavez Peoples’ Defense Front. “The 32-County Sovereignty Movement is a group of dissident republicans believed to be closely related to the Real IRA,” said the BBC on a webpage devoted to the unrest in Northern Ireland.